When creating a new document with the corresponding dialog, a list box 'Actual Size' zoom appears or disappears depending on whether or not the document units are pixels or points. Fine. To change settings later, the Document setup dialog can be used. Unfortunately, this behaves differently: Here, the 'Actual Size' zoom visibility does not depend on the current selection of document units inside the dialog, but on the selection previously made (prior to opening the document setup dialog). This already led to a lot of confusion in another forum - at that time, the above stated behaviour was not yet found. 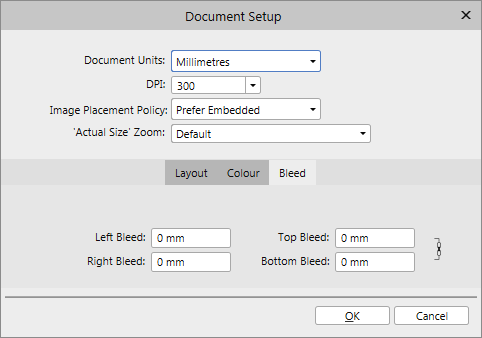 The screenshot shows the result of first creating a new document with pixel units and afterwards opening the Document Setup dialog and changing the unit to millimetres. The 'Actual Size' zoom is still visible in this case. It would be much more logical if the Document setup dialog showed exactly the same behaviour as the New document dialog with respect to the 'Actual Size' zoom visibility. I see that on Windows 10, too.